Okay, this is my first experience to cooking my own food using only rice cooker. I remember that I cook it around years 2010. 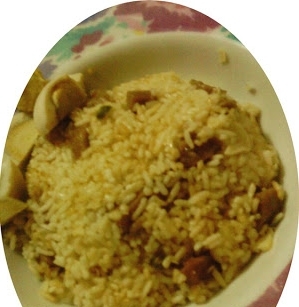 I use to be call it fried rice which cooked only by rice cooker. When I made it, I don't really understand the name of the food I cook but it can be eaten, so it make this food tolerable. My friends tells me the food name is mixed rice or rice meatballs huh? Haha actually I cook this when I'm still living on my boarding house in college. If you're a college student, living in boarding house and don't have many cooking tools so this recipe will be great for you. Before cooking the core material, I sauteed garlic wear margarine in advance until slightly brown, add onion until fragrant. Then I enter the washed rice below the water to cook the rice, sliced ​​green chili, beef meatballs, a little black pepper, salt, bouillon cube and soy sauce (it should also let existing celery for the green looks, but I forgot to buy it... hhh ) cooked by stirring occasionally to the bottom of rice cooker so the rice can't be charred and blackened. This is my first cooking results were 'forced' by using only my existing cooking tools, yes... this is my first dish cooked using rice cooker other than ordinary white rice, warm water and instant noodles. Once the rice is cooked, I sprinkle again with slices of boiled eggs which I got from I aunt when I want to return to the boarding house for the sake of my college life. Somewhat this food kind of like fried rice with a softer texture, because the water is create much difference with fried rice which using rice that is cooked while the rice using rice mixed all the ingredients then cooked together. I ate the mixing rice and nothing happen heheh. So it's healty enough I think. I roughly all the ingredients to make this meal could be valued around IDR 7,000 at that time of course heheh and can be used for two meals. Cheap! Yeah as a college student that time I love anything cheap. It's too easy to cook this by the way. So I think everyone can do this.